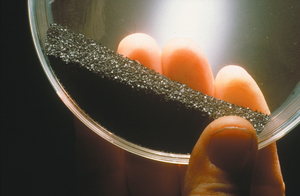 The Ultra-Clean Coal (UCC) process produces coal that has had virtually all of its mineral impurities chemically removed. This high-purity coal can be fired directly into gas turbines to provide high-efficiency, reduced-emission power generation. Through a two-stage process, energy in UCC can be converted into electrical energy with very high efficiency of 50 to 55 percent. Most coal-fired power stations in Australia are typically reaching efficiencies of around 33 to 35 percent, while very modern coal-fired power stations can reach efficiencies of up to 40 percent.The UCC-fired, gas-turbine combined-cycle system has the potential to produce 25 percent less greenhouse gas than best practice in a conventional coal-fired system. This can be translated to an overall reduction of 10 percent during its life cycle when mining, UCC production and transport are taken into account.